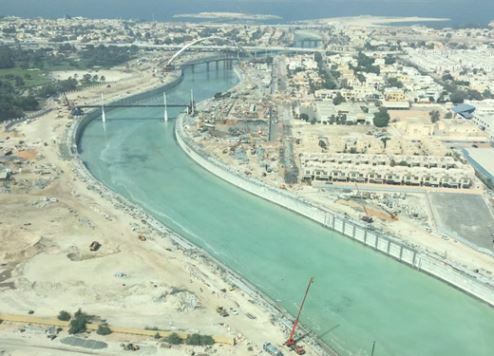 Dubai Canal, the AED2 billion, 3.2km man-made waterway linking Dubai Creek with the Arabian Gulf via Business Bay and Downtown Dubai, reached a major milestone this week, with water being pumped into the canal for the first time. Described as a modern and unique commercial and tourist destination, the canal will feature a sand beach, a marina for private boats, waterbuses, and three pedestrian bridges linking Jumeirah Beach Walk with Safa Park Walk. It will also feature a shopping centre, four hotels, 450 restaurants, walkways and cycle paths, when completed. Seawater will gradually fill the canal through a series of pumping stations over the coming weeks until it reaches an ultimate depth of six metres, allowing pleasure craft and even medium-sized boats to navigate through the waterway. Popular Dubai districts such as Satwa, Karama, Downtown Dubai, Bur Dubai and parts of Jumeirah and Business Bay are now located on what is effectively an island, linked to the ‘mainland’ by a series of new and existing bridges. “Dubai Canal is on track and our monitoring system in place ensures the project is ready according to the set plan,” Laila Taher Faraidoon, executive director of RTA, director general and chairman of the Board, Mattar Al Al Tayer’s Office, told local press this week. The canal is scheduled to officially open next month after three years of construction. It marks the biggest ‘mega-project’ to be completed in Dubai in 2016.